Large dogs' active temperament combined with a large body mass can put strain on their joints. Over time joints may become sensitive which can lead to mobility concerns. The Royal Canin Maxi Joint Care formula with its exclusive cocktail and EPA-DHA helps to ease movement and maintain dogs' well-being through healthy joints. After 1 month, 97%* of dog owners are satisfied. 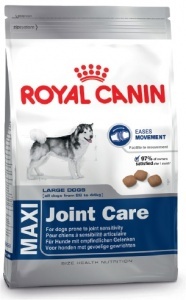 *ROYAL CANIN® internal study, 2014 – Study carried out with 60 large dogs. Maize; dehydrated poultry protein; wheat; animal fats; vegetable fibres; vegetable protein isolate; maize flour; rice; hydrolysed animal proteins; maize gluten; beet pulp; fish oil; yeasts; minerals; soya oil; hydrolysed collagen (0.84%); marigold extract (source of lutein); hydrolysed cartilage (source of chondroitin).